By 2023 Oklahoma will be having 1,512 mag 3+ quakes per year, more than 4 a day! More than 500 quakes of magnitude 3+ have been registered in Oklahoma so far this year, in 2009 only 2 were registered. Oklahoma's governor on Saturday declared a state of emergency for Pawnee County located near the epicenter of one of the strongest earthquakes ever recorded in the state. The 5.6-magnitude earthquake struck Saturday morning about 8 miles northwest of Pawnee City, damaging buildings, shaking food from shelves in local supermarkets and sending shock waves through several Midwestern states. Gov. Mary Fallin said in a statement that no injuries were reported and damage was limited, though the state of emergency designation for Pawnee County would open up funding for disaster relief and emergency preparedness and could bring in federal aid. Saturday's earthquake equaled another 5.6 earthquake recorded in 2011 in Oklahoma's Lincoln County, the largest ever documented in the state. Oklahoma has seen a rapid rise in the number of earthquakes over the last six years, which scientists link to the use of wastewater by the oil and gas industry. While the process of hydraulic fracturing, or fracking, is often associated with the uptick in Oklahoma earthquakes, some studies show earthquakes may instead be caused by companies pulling gas and oil from water found underground, then back into the earth through disposal wells. Historically, the state saw just two magnitude 3 earthquakes or higher per year prior to 2009, though that number surged to more than 900 in 2015 after domestic production of oil and gas increased along with the amount of wastewater. Earlier this year, state regulators curbed the amount of wastewater that the oil and gas industry can inject thousands of feet into the Arbuckle formation, a sedimentary rock layer found under Oklahoma that rests above fault lines. On Saturday, the Oklahoma Corporation Commission, which is in charge of regulating the state's oil and gas industry, began halting the use of 37 additional disposal wells across 725-square miles in the area surrounding the earthquake's epicenter. Fallin said the state also will work with the U.S. Environmental Protection Agency, which has "sole jurisdiction" over disposal wells in another nearby county. "Information on the earthquake is still being collected, and will be reviewed by my coordinating council on seismic activity," Fallin said. Beginning in 2009, the frequency of earthquakes in the U.S. State of Oklahoma rapidly increased from an average of less than two 3.0+ Mag earthquakes per year to hundreds per year in 2014, 2015, and 2016. 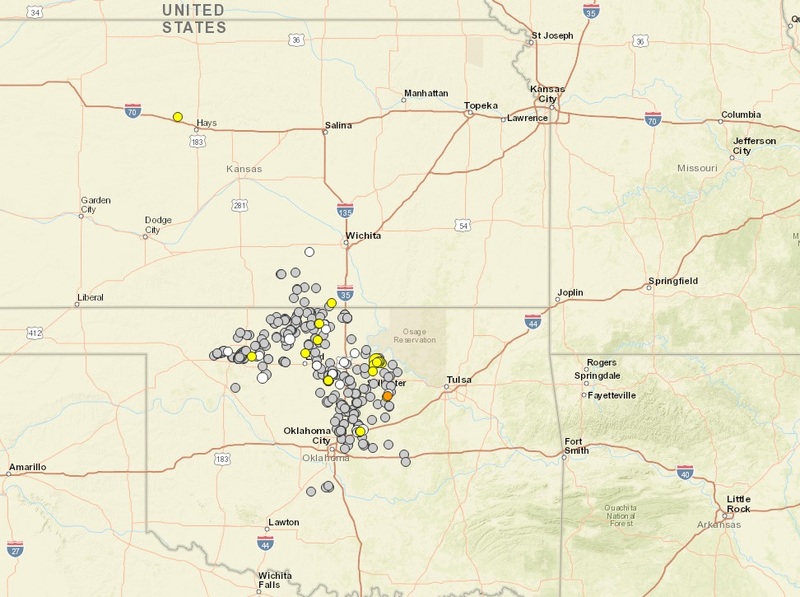 Thousands of earthquakes have occurred in Oklahoma and surrounding areas in southern Kansas and North Texas since 2009. Scientific studies attribute the rise in earthquakes to the disposal of salt water produced during oil extraction that has been injected more deeply into the ground. One of the most significant earthquakes of this swarm was a 5.6 magnitude earthquake east of the Oklahoma City area which was the strongest earthquake in the history of Oklahoma. Multiple seismologists advised local residents of an even greater risk of earthquakes in 2014 when the number of earthquakes increased to a dangerously high level. In response to the major increase in earthquakes in the Central United States, the United States Geological Survey began developing a new seismic hazard model to account for risk associated with induced seismicity. To date, no fewer than six individual earthquake sequences in Oklahoma have been identified and named by the Oklahoma Geological Survey. Other swarms have been observed in south-central Kansas and North Texas. According to data from the United States Geological Survey, there have been approximately 2,186 earthquakes in Oklahoma with moment magnitudes greater than or equal to 3.0, about 71 earthquakes with magnitudes greater than or equal to 4.0, and two earthquakes with magnitudes greater than 5.0 associated with the earthquake swarms from the beginning of 2009 through August 14, 2016. In March 2013, a peer-reviewed paper published by a research team led by seismologist Katie Keranen at the University of Oklahoma in the scientific journal Geology reported that "the volume of fluid injected into the subsurface related to the production of unconventional resources continues to rise" and that there was a link between the "zone of injection and the seismicity" potentially triggering the November 5, 2011 Prague earthquake. In March 28, 2016 the USGS released the USGS National Seismic Hazard Map which concluded that the primary cause of the earthquake in Oklahoma in 2011 was pressure on fault lines from cumulative effects of injecting oil drilling wastewater under high pressure into the underground. Although the 2011 earthquake was the largest on record, the USGS reported that the central and eastern U.S.
(CEUS) has undergone the most dramatic increase in seismic activity in the United States since 2009 with an average of 318 earthquakes of magnitude 3.0 a year up from 24 a year from 1973 to 2008. In 2015 there were 1,010 earthquakes in the CEUS region. By mid-March, 2016 there were already 226 earthquakes of magnitude 3.0 and larger in the CEUS. The oil industry pressured the OGS to release a statement saying "The interpretation that best fits current data is that the Prague earthquake sequence was the result of natural causes" which they later recanted. A near miss! New Zealand hit by many large aftershocks as mag 7.1 quake causes tsunami warning. The division in the USA is tremendous. From faith, to politics, and oldest to youngest. Maybe the rip through the Earth's Crust (New Madrid Fault Line) will show the physical rift in this nation. Unfortunately these earthquakes in Oklahoma will continue as long as the fracking continues. It is an endless cycle as more fracking creates more earthquakes while creating more fossil fuels to release more green house gases into the atmosphere and slowly kill the planet. If Oklahoma's government were smart, they would pass immediate legislation to ban fracking altogether and place a moratorium on any new oil sites, fracking or conventional. They should also consider giving tax credits to investors to have private companies build wind generation plants on the plains and begin the process of making fossil fuels obsolete. Lucky for us, President Obama will soon be leaving office and going over to the UN and become the head of that important government body, which WILL have the authority to shut fracking down in the US along with a host of other global warming causing factors. Within the next five to ten years and it could not come any sooner, the UN government under President Obama will finally save us from our own self destruction. I say, Amen to that brothers - amen indeed ! Your post is a magnificent example of the indoctrination capabilities of mass media and a totally corrupted educational system. A fitting final sentence to "cap" your graduation into the zealotry of evangelical environmentalism! You will be a highly useful tool in the hands of those seeking a future of deprivation, starvation, and death of the evil blight of humanity on this planet ! Congratulations ! Somewhat disappointed by the useless scree posted by the misguided individuals, hiding under the anonymous mantel. Obviously the gooberment is not the sole domain of Trolls.